On Tuesday, June 5, at 6 p.m. at Sears Woods, 1486 Mount Zion Road, Bucyrus, Join Josh Dyer as he monitors the health of the Sandusky River and how pollution is affecting wild life. 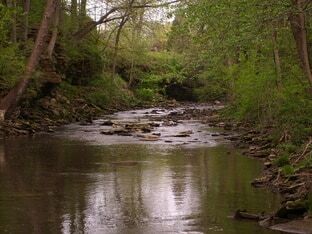 Data collected will be used to assess the health of Crawford County’s largest river. Wear rubber boots or old shoes. For more information contact the Crawford Park District office at 419-683-9000. Look for information on other programs offered by the Crawford Park District by visiting their web site at www.crawfordparkdistrict.org or by visiting our Facebook page. The Crawford Park District is having a youth fishing derby for kids ages 5-12 Saturday, June 9 from 9-11 a.m. at Lowe-Volk Park. Volunteer Rob Farson will be there to provide assistance. Prizes will be awarded for biggest fish, smallest fish, and more. Bring your own fishing pole, bait, and tackle. Call 419-683-9000 for information. On Saturday, June 9, at 11 a.m., meet park district naturalist Warren Uxley at Lowe-Volk Park. Participants will embark on a special field trip to explore the Tamarack Bog. Extremely rare in Ohio, this is the largest Tamarack Bog in the state and is extremely beautiful. Participants will form a caravan for this 90 minute drive to the nature preserve. Call 419-683-9000 for information. Join Crawford Park District Naturalist Josh Dyer at 7 p.m. June 12 at Unger Park, 1303 Bucyrus-Nevada Road, for a romp around the wetland. Wetlands are wonderful habitats with great biodiversity. They also make for fun and exciting ecosystems to explore. We’ll catch tadpoles, insects, and much more. Nets will be provided. Wear boots or old shoes. This is fun for the whole family. Call 419-683-9000 for information. Come to Lowe-Volk Park at 8:30 p.m. on June 16 for this fun event. Join Crawford Park District Naturalist Abby Ditomassi for a night that will brighten up your life by learning about bioluminescent bugs like fireflies. There will be many activities as well as a night hike with black lights to see these creatures in action. All ages are welcome; however, the night hike can be difficult for younger kids who have a fear of the dark. Call 419-683-9000 for more information. Is that stuff you discard trash or treasure? Before your trash goes to its final resting place, it can be turned into a treasure. On Tuesday, June 19 at 6 p.m., join Joy Etter-Link of the Crawford Park District who will show you how to turn various trash items into your own treasure. For kids up to grade 5 accompanied by an adult. Call 419-683-9000 for information. Nature nerds and geeks will unite for this fun event at 5:30 p.m. June 20 at Lowe-Volk Park The Crawford Park District urges you to step away from the computer and come out to Lowe-Volk Park and enjoy some fresh air for National Hike with a Geek Day. All ages are welcome. Call 419-683-9000 or information. On Saturday, June 23, at 10 a.m. at Daughmer Savannah, 786 Marion Melmore Road, help the Crawford Park District and others eradicate teasel at one of the best natural areas in the Midwest. Teasel crowds out our native plants, affecting Daughmer’s botanical diversity. You’ll be teaming up with members from our partner group, ONAPA (Ohio Natural Areas & Preserves Association) to rid Daughmer of this invasive species. Bring work gloves and bug repellent. Shovels and water will be provided. Meet at the parking lot at 786 Marion-Melmore road, just north of Ohio 294. For more information call 419-683-9000. Come and get dirty from 11 a.m. to 1 p.m. at Lowe-Volk Park. Current science points to many positive attributes of playing in the dirt. Why not help the Crawford Park District celebrate International Mud Day. There will be opportunities to get your toes or hands muddy … or to get completely covered in mud. Members of the Jefferson Township Fire Department will be on hand to help you get rinsed off before going home. This is fun for the whole family. Call 419-683-9000 for information. Join members of the Crawford Park Astronomy Club at 9 p.m. June 23 at Lowe-Volk Park as they share their knowledge and telescope skills. Targets for the summer include: M-104 Sombrero Galaxy, M-3 Globular Cluster, Rosette Nebula, and Jupiter. Bring your own telescope or allow the volunteers to assist you with those provided. Call 419-683-9000 for information, visit at www.crawfordparkdistrict.org or visit the park district’s Facebook page.